ACRYLITE, CYROLITE, CYRO, and CYROLON are registered trademarks of Cyro Industries. DELRIN, KAPTON, KEVLAR, MYLAR, TEFLON, TEFZEL, VESPEL and ZYTEL are registered trademarks of E.I. Du Pont de Nemours and Company. ARDEL, RADEL, TORLON and UDEL are registered trademarks of Solvay Advanced Polymers, LLC. KYNAR and PLEXGLAS are registered trademarks of Arkema Inc.
SINITIMID is a trademark of Ensinger Engineering Plastics, Inc.
RULON is a registered trademark of Saint-Gobain Performance Plastics. CYCOLAC, LEXAN, NORYL, ULTEM and VALOX are registered trademarks of SABIC Innovative Plastics. CELCON is a registered trademark of Ticona. CELANESE is a registered trademark of Celanese Corporation. CELANEX is a registered trademark of Celanese International Corporation. OILAMID is a trademark of Licharz Engineering Plastics. LUCITE is a registered trademark ICI Acrylics, Inc.
KEL-F is a registered trademark of Minnesota Mining and Manufacturing, a 3M Company. KYDEX is a registered trademark of Kleerdex Co.
GLASTIC is a registered trademark of The Glastic Corporation. REXOLITE is a registered trademark of C-LEC Plastics, Inc.
NYMETAL, NYLOIL and NYCAST are registered trademarks of Cast Nylons LTD.
HAYSITE is a registered trademark of ALCO Industries, Inc.
MICARTA is a registered trademark of IL Norplex-Micarta. VEKTON is a registered trademark of Ensinger Industries, Inc.
VICTREX and PeeK are registered trademarks of Victrex PLC Corporation. ULTEM is a registered trademarks of General Electric Co. USA. UVEX is a registered trademark of Eastman Kodak Company. Values shown are for test samples and are believed to be typical. No warranty is to be construed. In fabricated or molded form, parts may vary from standard test data. Where specific or unusual applications arise, tests should be performed on actual parts. There is no warranty, express or implied, concerning the above properties. 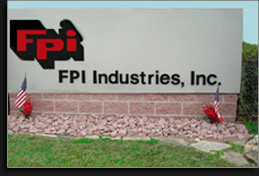 Under no circumstances shall FPI Industries, Inc. be held liable for incidental or consequential loss or damage.